Another person with this knowledge, is Joe Roth. He produces evil and he produces it well. With hits like ‘Alice in Wonderland‘ and it’s upcoming sequel, along with ‘Snow White and the Huntsman‘ and ‘Oz the Great and Powerful‘. Not to mention the upcoming Maleficent vehicle for Angelina Jolie’s wicked bone. Roth is adding to the list with a new announcement that features the puppy hating, but fur loving, fashionista, herself, Cruella De Vil. Hushpuppy is what we’re getting from anyone attached to the project to tell us how wicked Cruella will go. Will it be a cartoonish evil like the Glen Close live action flicks? Or will this version have children and adults clutching their pets tight when they leave the theater? If they go too canine hating, is the ASPCA going to picket or protest the movie? Obviously someone will be onset to ensure that no harm comes to whatever little perky eared mouth breathers they use in the film. The only hint we can get as to what to look forward to is to look at the screenwriter assigned to the project. Aline Brosh McKenna has recently written the script for Cinderella which just began filming with Kenneth Branagh directing. She’s also credited, probably most widely known for her screenplay based on the book ‘The Devil Wears Prada‘. 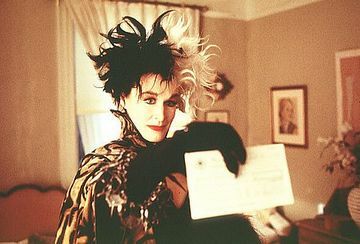 Honestly Meryl Streep in Prada is basically an extremely yuppified and a bit less vilified Cruella De Vil. Then the most important question for this film lover…who is going to play the wicked woman with a penchant for black and white down to her hair? I’ve given it some thought and first I kind of liked the idea of maybe Kathy Bates pulling out her crazy flag she waved in ‘Misery‘. If we’re going to re-make Cruella De Vil, let’s RE-MAKE the typical expectations of her appearance. Instead of the long, sinewy body shape, go a different direction. I like this idea because I can more relate to Bates’ body shape and maybe she’s just pissed off that no one makes puppy coats in her size? I can absolutely relate to that level of crazy! Then I looked back through some other actresses that can pull off De Vil in perhaps a more understated and more frightening evil way. As opposed to Bates’ maniacal fanaticism possible take on the character, let Tilda Swinton take a whirl in the puppy love boat. Swinton frightened me so easily in The Chronicles of Narnia, that I can see that same cold, unrelenting, evil demanding puppy flesh. Either way, we better have a reprise of the ‘Cruella De Vil’ song made popular in the 1961 Disney animated movie, or this will be one ticked off film goer. This entry was posted on Tuesday, October 1st, 2013 at 10:25 am	and is filed under Film, News. You can follow any responses to this entry through the RSS 2.0 feed. You can skip to the end and leave a response. Pinging is currently not allowed.